Mining for valuable and applicable information from data was the task of our computers over the past fifty years in the aptly termed “Information Age.” Yet, the focus of the 21st Century will be a shift from the computer as simply a provider of basic information. Computers of the near future will be used to extract knowledge from information. Rapid advancements in technology, increased volume and complexity, and the wide and easy access to information create a new demand for the computer. The main focus of humankind in the current century is starting to utilize technology for intellectual activities – or what can be termed as the emerging “Knowledge Age." The technologies of the “Knowledge Age” are transitioning our focus from individual, isolated information systems and repositories to an expanded exchange and sharing of information in order to broaden the size and depth of knowledge available to individuals and activities. According to leading researchers around the world, by the year 2010, more than one trillion intelligent computing devices will be utilized in all aspects of the commercial environment. But, what is Intelligence? The concept of Intelligence is built upon four fundamental principles, which include: Data, Information, Knowledge, and Wisdom (also know as Intelligence). Knowledge, the third principle, is the subjective interpretation of Information in effort to recognize the applications and approach to act upon in the mind of perceiver. As such, Knowledge is hard to conceive as an absolute definition in human terms. It attaches purpose and competence to Information, resulting in the potential to generate action. Lastly, Wisdom (or Intelligence) embodies awareness, insight, moral judgments, and principles to construct new knowledge and improve upon one’s existing Knowledge. According to the Merriam-Webster Online Dictionary, Knowledge is “the sum of what is known: the body of truth, information, and principles acquired by mankind.” Or as A.C. Foskett puts it: "Knowledge is what I know, Information is what we know." Reasoning knowledge » What conclusion is valid in what situation? Assimilative knowledge » What its impact is? * Due to the broad applicability of process management to knowledge modeling this topic is branched out into separate write-ups. Click here for details on Procedural knowledge a.k.a. Process Management. For more than two millennia, intellectuals, philosophers and scientists have tried to conceptualize awareness, information, knowledge and intelligence in various shapes, forms and situations. Unquestionably, many efforts have been made and many applications have been developed that resemble the capture and use of Knowledge in various forms by using different methods. However, with the rapid increase in the amount of available information combined with the flexibility in accessing this information put forward the need for a concentrated effort to accelerate our utilization of information under a common framework. As available technology advances our expectations and level of complexity embedded with knowledge, this situation increases the need for effective synthesization and efficient distribution. In time, Knowledge will gradually move into the sphere of the public domain – where it becomes “information”, while at the same time new knowledge gets created. 2. What is Knowledge Modeling? If you think information is valuable, then you should see knowledge in action! "Knowledge Capture and Modeling (KCM) – or in short Knowledge Modeling – is a cross disciplinary approach to capture and model knowledge into a reusable format for purpose of preserving, improving, sharing, substituting, aggregating and reapplying it. In the computer world it is used to simulate intelligence." Innovation, progress and prosperity, all depends heavily on making the “right decisions”. The good news is that making right decisions is not hard. For a rational agent there is no way of making wrong decisions, given “all” the facts and a “clear” objective. The only reason for making wrong decisions is by neglecting the facts or misinterpreting the goal. That is why Knowledge Modeling is such a critical element of cognitive discipline and a prerequisite for reaching true Artificial Intelligence. “Applied knowledge” is so very important to the immerging “Knowledge Age.” “Applied knowledge” contributes to scores of intellectual activities, from continuous improvement to automated decision-making or problem-solving, and hence increases “Intellectual Capital” for generations of humankind to come. The fundamental goal of KCM is to bring methodologies and technologies together in an implementation neutral framework as a practical solution for maximizing the leverage of knowledge. The core difference between working with information and knowledge is that – in addition to facts – a Knowledge Model includes enactment and has the ability to support intuition as well as the subjectivity of experts and/or users. In everyday situations, people make a variety of decisions to act upon. In turn, these decisions vary based on one’s preferences, objectives and habits. The following example, Figure 1 – Situational Effects, highlights how gender and age play a role in the decision-making process. As such, many models, like the example of Jim and Jane, can only be executed after having a profile assigned. A profile is defined as the personnel interpretation of inputs to a model. KCM incorporate the quantitative and qualitative use of information, and processes tangible and intangible attributes that contribute to end result, such as Jim’s decision of buy a sport’s car. The bridging together of quantitative and qualitative methods enables KCM to incorporate subjectivity, which is the main differentiator between information and knowledge. Each model can have data, information or outputs from other models as input. As such, models can be chained, nested or aggregated. For consistency in this paper all inputs to a model are considered as “information”. As such the output of a model would be referred to as information, when used as input to another model. Among its benefits, a Knowledge Model has the ability to be constantly monitored and improved. Furthermore, Knowledge Models help us to learn from past decisions, to assess present activities and, just as important, to preserve domain expertise. KCM saves time and overhead costs, and reduces the mistakes from overlooks. Knowledge Models are very valuable and often outlive a particular implementation and/or project. Accordingly, the challenge of KCM is that this process must be designed not only as an abstract idea, but as an implementable process with the ability to aggregate and disseminate applied knowledge for the purpose of creating intellectual capital for generations of humankind to come. There are countless possible applications for KCM just as there are countless intellectual activities performed by humankind around the world. In these applications, Knowledge Models provide capabilities to monitor and detect malicious activities, abnormalities, patterns or trends and trigger actions as a result. The actions can cover a variety of scenarios ranging from email & SMS notification to automated case handling (see automation section below). Think of network intrusion or credit card fraud detection systems as the obvious applications in this category. However, besides applications that have Monitoring and Detection as their primary usage, this functionality can be added to many other type of applications to provide accumulative benefits on top of the main purpose. Think of a traditional CRM system that can be augmented with a Knowledge Model to monitor shaping trends in pipeline, revenue or customer service calls; or an Accounting or HR system that can be enhanced to detect policy violations. Knowledge Models are actively utilized in profiling and adapting to environments, users and customers’ needs, habits and interests. This allows for higher quality of self-service and effective personalization in variety of applications ranging from targeted advertising and product recommendation to blog and news websites. Good examples of this utilization are companies such as NetFlix and Match.com that at some point decided to emphasize their focus on sophisticated Knowledge Models for recommendation. And, who are ever since improving these Knowledge Models by a dedicated team. Many businesses, operational and system processes are fully or partially automated using some kind of software. In this category, Knowledge Models dictate and coordinate execution of a series of human and system activities as a controlled sequence within a methodical, organized framework. As example, think of dealing with a fraud alert, that results in a sequence of regulatory required actions such as: SEC reporting, account suspension, client notification, investigation, and so on. In this category, Knowledge Models empower applications to provide decision-making support to their users. This could be as simple as context sensitive help or as complex as credit risk prediction in financial applications or automatic contouring in volumetric medical imaging. This category is by far the largest and includes areas such as Predictive analytics, guided Self-service and Diagnostic systems. Imaginably various applications within each category can be constructed. For example, a KCM model may be used for investment activities, such as valuation, risk assessment or imposing a best practice methodology to the due diligence workflow. The importance of such a model can be measured by its contribution to the “expected value” of the investment transaction. There are already many applications available that directly or indirectly operating a KCM model. Among them are authoring tools such as Analytica and Protégé, knowledge bases such as Xaraya and KnowledgeStorm, and reasoning or analytical models such as MetaStock or Apoptosis, as well as many strategic games. Noteworthy, an important aspect of Knowledge Modeling is the incorporation of users’ subjectivity that is missing from many current solutions. - The number or complexity of parameters involved in an activity makes it hard to proceed without risk of overlooks or without computational aids. - The decision-making process is so important and stakes are so high that one cannot afford making any mistakes. In other words, when the Cost of Mistake or Value of Certainty is so high that it justifies the effort. - Streamlining and/or continuous improvement of repetitive activities. - Preserve and build upon domain expert efforts in house. - Capture and package domain knowledge for transfer, share or sale. - Facilitate decision-making by less skilled workers. - To automate tasks and/or business processes. The below example, Figure 2 – Simplified Decision Mode, shows a simplified decision model for "buying a used car.” In this example, both quantitative and qualitative elements are used in the decision-making process. This type of model is used for diagnosing problems by categorizing and framing problems in order to determine the root or possible cause. Example: I have these symptoms. What is the problem? This type of model is designed to produce possible options for a specific case. The options may be generated using techniques such as Genetic Algorithms or Monte Carlo simulation, or retrieved from a knowledge and/or case-base system. Example: Ok, I know the problem. What are my options? This type of model is used mainly for the decision-making process in order to assess or select different options. Of course, there would be always at least two alternatives; otherwise there is no need for making any decision. Example: Now I know the options. Which one is the best for me? Analytical Models are mainly used for analyzing pre-selected options. This type of model has the ability to assess suitability, risk or any other desire fitness attributes. In many applications, the Analytic Model is a sub-component of the Selective Model. Example: I picked my option. How good and suitable is it for my objective? Instructive (or Prescriptive) models provide guidance in a bidirectional or interactive process. Among the examples are many support solutions available in the market. Example: How can I achieve that? A Constructive Model is able to design or construct the solution, rather than instructing it. Some of the recently popularized Constructive Models are used for generating software codes for various purposes, from computer viruses to interactive multimedia on websites like MySpace.com. Example: I need a <…> with these specifications <...>. As a best practice approach knowledge models should stay implementation neutral and provide KCM experts with flexibility of picking the appropriate technology for each specific implementation. In general the technology solutions can be categorized into Case-based systems and knowledge-based systems. Case-based approach focuses on solving new problems by adapting previously successful solutions to similar problems and focuses in gathering knowledge from case histories. To solve a current problem: the problem is matched against similar historical cases and adjusted accordingly to specific attributes of new case. As such they don’t require an explicit knowledge elicitation from experts. Expert or knowledge-based systems (KBS) on the other hand focuses on direct knowledge elicitation from experts. There are a variety of methods and technologies that can be utilized in Knowledge Modeling, including some practices with overlapping features. Highlighted below are the most commonly used methods. A Decision Tree is a graph of options and their possible consequences used to create a plan in order to reach a common goal. This approach provides designers with a structured model for capturing and modeling knowledge appropriate to a concrete-type application. Closely related to a Decision Tree, AHP (Analytic Hierarchy Process) developed by Dr. Thomas Saaty bestows a powerful approach to Knowledge Modeling by incorporating both qualitative and quantitative analysis. Influence-based systems such as Bayesian Network (Belief Network) or ANP (Analytic Network Process) provide an intuitive way to identify and embody the essential elements, such as decisions, uncertainties, and objectives in effort to better understand how each one influence the other. An Artificial Neural Network (ANN) is a non-linear mathematical or computational model for information processing. In most cases, ANN is an adaptive system that changes its structure based on external or internal information that flows through the network. It also addresses issues by adapting previously successful solutions to similar problems. Inspired by biological evolution, including inheritance, mutation, natural selection, and recombination (or crossover), genetic and evolutionary algorithms are used to discover approximate solutions that involve optimization and problem searching in Explorative Models (refer to Model Types). Expert Systems are the forefathers of capturing and reusing experts’ knowledge, and they typically consist of a set of rules that analyze information about a specific case. Expert Systems also provide an analysis of the problem(s). Depending upon its design, this type of system will produce a result, such as recommending a course of action for the user to implement the necessary corrections. Statistical Models are mathematical models developed through the use of empirical data. Included within this group are 1) simple and/or multiple linear regression, 2) variance-covariance analysis, and 3) mixed models. Another effective tool for Knowledge Modeling is a Rule Engine, which is categorized as an Inference Rule Engine or a Reactive Rule Engines. The Inference Rule Engines is used to answer complex questions in order to infer possible answers. For example, a Mortgage Company would ask - "Should this customer be allowed a loan to buy a house?" Reactive Rule Engines are used to detect and react to interesting patterns of events occurring and reacting. Other technologies that can be used in Knowledge Modeling include the conventional programming approach, and various Knowledge Management systems. Even simple scripting in Excel could be used in some KCM applications. During the implementation process of Knowledge Modeling, four basic stakeholders are involved throughout the duration of the project, including the 1) Knowledge Provider, 2) Knowledge Engineer and/or Analyst, 3) Knowledge System Developer, and 4) Knowledge User. Many Knowledge Modeling projects intertwine a series of sequential models, which can be nearly identical in design, incorporate unlike decision values or be radically different. As such, KCM Experts have to plan, design and model the solution accordingly. - The development process is iterative and will require extensive supervision. - Knowledge Models often outlive a particular implementation procedure – focus first on the conceptual structure and leave the programming details for later consideration. - There will be a great demand for extendibility and ongoing maintenance. - Errors in a knowledge base or model can cause serious problems to the project. - Focus on extendibility, reusability, interoperability, modularity and maintainability. - Ideally, KCM models have to closely resemble the human mind and thought process. - Expectations have to be carefully managed. KCM is extremely powerful – not a solution for solving every problem. - It is very important to ask the right questions, understand the appropriate breakdowns and consolidate the embedded elements. The Goal Setting and Planning Phase is to identify the project’s objectives and requirements. Only a clear description will result in a successful Knowledge Modeling project. Make sure to sufficiently manage expectations during the requirement analysis segment. What is to be achieved? What are the User Input and Output requirements? Generalize as much as possible while keeping the trade-offs of generalization in check. Make sure that the level of generalization is acceptable to the User. At this step in the project, a Knowledge Model should be viewed as a “blackbox.” A decision should be made as to the Expected Inputs and Outputs of the model (also referred to as Direct Input/Output). Depending on the User, the type of model (including its required interfaces) may vary dramatically. Some Knowledge Models are used only programmatically, while others may require human interaction in order to operate. The Knowledge Model should not only consider the interpretation of information, but also consider the consequences of each decision path and its respective risk sensitivity. The KCM Expert may have to manage for the uncertainty and quality of Inputs (or information). In many cases, the level of certainty is represented as probability in light of their possible consequences. Furthermore, take into consideration the fact that the model’s Output may lead to different courses of action, and the consequence of such action would determine the value of the Output. In turn, the Output’s value depends on the problem at hand and the Output may represent a different value in a separate application. The first question to ask is “What affect can the Output have on a decision or activity? The Knowledge Elicitation and Breakdown Phase focuses on extracting knowledge from Experts, including high-level input requirements and processing methods within a structured and formalized profile. At its basic level, Phase 2 presents an implementation-independent description of knowledge involved in a given task. Domain knowledge elicitation and terminology mismatching present a challenge during the Knowledge Elicitation and Breakdown Phase. Asking the right question(s) is the key element to overcome this challenge. In most cases, in addition to Direct Inputs, KCM models require Supporting Inputs in order to produce results. According to objectives outlined in Phase 1, domain Experts should select and define the required supporting inputs for the Model. This supporting information is to be utilized in the model processing to produce the expected Outputs. However, in an ideal situation, KCM models should be designed to operate independent of Supporting Inputs or uncertainty. To compensate for this incomplete processing ability, the model’s Output(s) may include probability, confidence or risk level. This phase will include interview with subject matter experts and other stakeholders to identify supporting inputs required to generate the outputs and the processing approach. . The Supporting Inputs typically include tangible and intangible factors and/or forces affecting the Outputs. The interview process should consider the breakdown of Inputs in order to create sub-models for the purpose of increasing usability, accuracy and manageability. Referred to as Top Down Modeling, this approach oftentimes produces the best results in the interview process. Following diagram illustrates the breakdown of one of decision elements in a separate model. In the following example, one of the assessment elements is externalized in a sub-model that can be utilized independently. This approach empowers Users to monitor, evaluate and eventually replace sub-components separately by hand-picking equivalent models from other experts, if desired. - Focus on and start with top-level most influential Inputs. - Begin with the minimum number of parameters and gradually breaking them up in each iteration. - Even the Inputs with unknown and/or uncertain values have to be included in the model. - Take note that some inputs are not known and meaning “we don’t know that we don’t know them”. Some implementation alternatives consider this fact, and include a few unobservable Inputs into Model. - Keep the number of Inputs to a minimum; however, selecting the right Inputs is crucial. These Inputs may be nonlinearly-related and have a very low correlation. Avoid using high correlation Inputs. The most important element in the Knowledge Elicitation and Breakdown Phase is to correctly and completely define the Inputs and Outputs. Decision Trees and Influence Diagrams may be of assistance in this phase. An Influence Diagram is a simple visual representation of a problem and offer an intuitive way to identify and display the essential elements, including decisions, uncertainties, and objectives, and how they influence each other. Mind Mapping applications present another good tool for capturing information in a structured format. Among these applications, FreeMind is one of the best options available. During this Phase, each Input has to be associated with a source and/or proxy. A proxy source may be considered if a direct source can not be identified. The underlying objective of this Phase is to instill modularization and simplification. Keep in mind that some Inputs may require the Expert’s personal judgment about uncertainty, while other Inputs may be retrieved programmatically from independent sources. 3) The model implementation will smoothen the input and classify it before putting it to use. Inputs have to be analyzed and, if possible, consolidated because some Inputs may be used in multiple sub-models. Furthermore, multiple model aggregation may be implemented during Phase 3. Specific applications may benefit by aggregating parallel models as illustrated in the diagram below. In this example, both manual and a semi-automated diagnostics sub-model are aggregated into the main model. Such aggregation could provide another level of validation for mission critical applications. The same model is used with different weight sets. The model and its weights are fixed, but the sub-models are selected based on User preferences. Both the model and its weights are customized for the User. While the initial weight setting is done during the implementation process, models should support “profile change.” This refers to the runtime adjustment of weights according to the User’s preferences. For example, the same analytic model designed to assess the risk of a transaction may be executed by two distinct Expert profiles in effort to utilize different assessment opinions. The process of obtaining and assigning the importance level of Inputs is referred to as “Preference Elicitation” in order to obtain a good and useful description of the preferences and/or objectives. In general, it is difficult to elicit preferences and objectives because of the “fuzzy thinking” nature of the human mind. In many cases, Experts are more comfortable making qualitative preference statements such as “I like this more than that.” This type of ranking (also known as comparative preference elicitation) is a very useful first step for selecting the weights within Inputs. In some applications, statistical analysis may be used for proposing the initial weightings before an Expert’s review. The Prototyping and Feasibility Check Phase introduces a proof of concept for the proposed model. The purpose of this Phase is to simulate, link together and test against a limited number of sample cases related to Inputs and Plans Modules in order to validate the solution of the problem statement. The result from such a feasibility check may suggest the iteration of a previous phase. In many cases, a simple spreadsheet or a Decision Tree can provide enough support for a high-level feasibility analysis. A more in-depth analysis can be conducted at each sub-model level. Accuracy is then measured against the difference between the observations from known cases verses the model’s Outputs. Deviations can be represented in standard statistical forms, such as Mean Squared Error (MSE). The level of acceptable error is identified through a sensitivity analysis. Missing Inputs are by far the most important factors contributing to such deviations. Thus, the initial step to fix a poor-performing model is to include revised input selection. Unknowingly, experts sometimes leverage other freely available Inputs from the environment or case-based exceptionalities that are hard to elicit, unless directly asked during the interview process. Therefore, it is very important to review all discrepancies from expected Outputs with domain Experts. Other common causes of deviations are inappropriate weight settings and the poor quality of the operator’s quantitative inputs. To avoid dealing with multiple points of failure at the same time, each potential source of a problem ideally has to be examined in isolation. Using the same weight setting will help eliminate one point of failure. Additionally, an independent profiling test should be performed to validate the model by using different profiles from different Experts. During the Design and Implementation Phase, KCM models are designed and handed over to developers for implementation. Selecting the right design and technology is the key to a successful project. At some point, models will have to deal with both the quantitative and qualitative use of Input information in light of their significance and cost of acquisition. Therefore, the model design should not only involve technical, but also economical decisions. Trade-offs between model accuracy, performance and cost of operation will dictate the design’s requirements. The best way to properly manage this situation is choosing the right use of the Input Processing Mode. Models may be designed with Parallel or Sequential Input Processing or a combination of the two. Parallel Input Processing generates maximum performance, however, it requires all Inputs to be presented at the same time. Since some of the Inputs are extremely costly or time-consuming to acquire, Parallel Input Processing may not always be feasible. Alternatively, a Sequential Input Processing may eliminate the need of some Inputs, if not applicable to the presented case – hence saving time and/or money. Selecting the right processing model in accordance to the significance and cost of acquisition for each Input will result to an optimal design. However, this situation may not be possible because some Inputs require a specific mode of processing. In the following diagram, the model leverages both Parallel and Sequential Input Processing to eliminate unnecessary Input needs. For example, in an Investment Selection Model, the Rate of Return (ROI) may be used initially as a self-sufficient filtering element to eliminate alternatives with expected ROI below a certain threshold. But it is also used at a later stage in conjunction with Risk in the selection process. While both ROI and Risk by themselves can be used in the elimination process, neither can be used as standalone indicators in the selection process. The phasing of Input data gathering can be extended to the application layer. 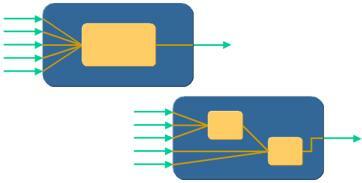 In turn, data gathering may happen in a synchronized or an asynchronized mode. For instance, a workflow system could manage the data collection process in an asynchronized mode and publish the results or notify Users when the Outputs are available. When no real-time requirements exist, more complex applications could benefit from such asynchronies approach in favor of cost saving and load balancing. At this juncture, a decision needs to be made as to how to deals with missing Inputs. While Direct Inputs are usually mandatory, the Supporting Inputs should be designed as optional. Under certain circumstances, this obviously may not be possible. The model may use a single or a set of default values to be used for missing Inputs. Such default values can be calculated as a statistical average. A model may be designed to approximate a value for missing Input based on internal rules or other presented Inputs. A wrapping model may include multiple models and internally switch to a model designed without any dependency to missing input. In general a model will include four distinct layers, as illustrated below.The first layer will manage the data transformation. In many cases, the Input data has to be transformed before the actual processing can begin. A transformation module will perform such pre-processing. The second layer is to validate the Input data according to the model’s requirements. Even though validation can be done at the application level, as a best practice approach, having a model’s internal data validation is highly recommended. Then, the actual processing, the third layer, may begin. Finally, the resulting data may require post-processing in order to be returned to the User or wrapping application. The Monitoring and Maintenance is an ongoing process throughout the life of Knowledge Models. The level and sophistication of human knowledge is constantly increasing and as such the expectation of Knowledge Models. Unless regularly maintained and improved, designed models will become obsolete as the modeled knowledge changes. At times, continuous calibration can be designed and performed in an automated manner, as done in unsupervised learning systems such as ART-ANN (Adaptive Neural Networks) or cybernetic control systems. However, regularly monitoring and improvements should be scheduled in a controlled environment. This paper does not provide investment advice, and should not be relied on as such nor is it a substitute for investment advice. The statements and opinions expressed here are solely those of the author and are not intended to constitute professional advice. Any reliance upon this shall be at the user's own risk, without any recourse to the author and his associations. Pejman Makhfi is a Silicon Valley technology veteran, serial entrepreneur and angel investor in the high-tech industry. Pejman has more than fifteen years of progressive experience in providing consultancy services and best practices to entrepreneurs, technology investors, and forward-thinking Startups. Widely known as a leader in the field of Business Process Automation and Knowledge Modeling, Pejman has an extensive background in the software and financial industries and has been the key architect for several award-winning industry leaders, such as FinancialCircuit and Savvion. Today, Pejman is the Director of Venture Development at Singularity Institute, Managing Director of a private angel group and is a member of Venture Mentoring Team where he provides assistance and guidance to several early-stage companies, including Novamente and Perseptio. His background includes executive position at TEN, a top Silicon Valley technology incubator hosting more than fifty Start-ups. Pejman managed TEN's R&D as well as advised clients on the issues and trends affecting early stage and emerging growth companies. Since its inception, TEN has helped launch of over sixty Startups, including eBay, iPrint, Xros, Vertical Networks, Right Works, and Intruvert Networks. Mr. Makhfi holds a B.S./M.S. degree in Computer Science from Dortmund University in Germany and is an internationally licensed Project Manager (PMP) as well as a certified Lean Six Sigma Black Belt (SSBB) in continuous business improvement. He has authored multiple Patents and standards and is an active contributor to organizations such as "IEEE Neural Networks Society", "American Association for Artificial Intelligence" and “American Society for Quality”. Mr. Makhfi is the author of numerous articles, including Heptalysis - The Venture Assessment Framework. This paper is copyrighted by author, but it may, by the author's permission, be freely downloaded, translated, printed, copied, quoted, distributed in any appropriate media providing only that it not be altered in any way in text or intent and the author is properly credited.